The world renowned Mormon Tabernacle Choir (MoTab) is under attack by one of their own. Jan Chamberlin, a five-year veteran of the choir has resigned in protest because her church accepted an invitation by Donald Trump for the choir to sing at his inauguration. Participation by choir members is voluntary. Chamberlin could have just opted out, and no one would have noticed. Only 215 of the choir’s 360 members will get to perform at the inauguration. However, Chamberlin went much further by calling attention to the reasons for her resignation in a long emotional Facebook post (since removed) critical of the church’s decision. What was particular galling for many Mormon faithful Trump supporters was her comparison of Trump to Hitler: "I only know I could never 'throw roses to Hitler.' And I certainly could never sing for him." "Looking from the outside in, it will appear that Choir is endorsing tyranny and facism [sic] by singing for this man….And [the] Choir's wonderful image and networking will be severely damaged and that many good people throughout this land and throughout the world already do and will continue to feel betrayed. I believe hereafter our message will not be believed by many that have loved us and adored what we have stood for. I know that I too feel betrayed." "History is repeating itself; the same tactics are being used by Hitler (identify a problem, finding a scapegoat target to blame, and stirring up people with a combination of fanaticism, false promises, and fear, and gathering the funding)." Those are some very harsh words of criticism by Chamberlin of her church and fellow choir members if they still decide to sing. Her statement has raised eyebrows throughout the church’s hierarchy, perhaps not as much for her outspoken views, but rather for the negative publicity that it has brought against the church. Chamberlin is just one voice on the 360-member choir. Will other choir members come forth and support Chamberlin? Probably not, at least not in big numbers and certainly not publicly. Chamberlin by her public actions has cast criticism against the leadership of the Mormon church and choir. This would normally be a big “no no” in the eyes of the church. While her actions certainly are not of the scale of a church member who commits apostasy and is shunned, it nevertheless has put many in the Mormon faith in the uncomfortable position of choosing sides, where church unity and harmony on public issues is usually the norm. Many Mormons are indeed now speaking out, signing petitions and otherwise criticizing the decision to put their beloved choir into that unfamiliar and uncomfortable spotlight. For the leadership of the church, the decision to accept the Trump invitation likely carried more pluses than minuses. First one has to remember that Mormons in Utah voted overwhelming for Trump by a 36 point margin over Hillary Clinton -- but still much less than the 65 point margin of the born again Christian evangelicals voting for Trump. Such strong Mormon support for Trump is indeed remarkable considering the disparaging remarks Trump has made about the church “an alien religion” and their elder statesmen, Mitt Romney. With Trump’s overwhelming mandate in the Utah election, it may be why the church’s leadership jumped at the chance to have their choir sing at Trump’s inauguration. When you get down to the bottom line, most Mormons support Trump, although not enthusiastically. That is a fact. It is also good business to have the church sing in any event. Their choir is very, very good…outstanding, and wherever they sing, they cast Mormonism in a positive light. They help recruit new members. The Mormon choir previously sang at the inaugurations of Ronald Reagan, George H.W. Bush, and George W. Bush, but not Bill Clinton or Barack Obama. So political leanings could also be a factor. Mormonism as a religious organization is very conservative, and Utah is a solid red state. Nevertheless, as Jan Chamberlin’s protest also points out, people regardless of religion and political affiliation have a conscience, and sometimes that conscience should indeed trump all the other factors. The Mormon church must listen to what Chamberlin says and privately poll members of the choir. Just because others in the church choir are afraid to speak out, it doesn’t mean she is wrong. As Chamberlin stated, "I hope we can throw off the labels and really listen to each other with respect, love, compassion..."
The Mormon church choir needs to heed Chamberlin's words and cancel out of their spot to sing at the inauguration. It is a difficult choice, but it is the right choice. Before writing this article, I spent time in Mormon blogs reading the differing views of Mormons on this issue. It would seem those opposed to MoTab participating are very passionate about adhering to the church's teachings and that participation represents hypocrisy. 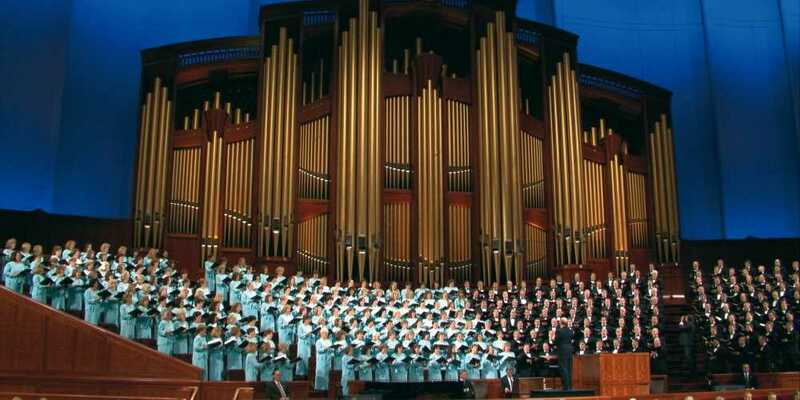 Others argue that the church is political neutral and that MoTab should participate. The MoTab website itself has zero comments -- you can read into that what you want, but that was the first place I looked. I like unofficial Mormon blogs where Mormons can speak freely. "We believe the incoming president has demonstrated sexist, racist, misogynistic, and xenophobic behaviors that do not align with the principles and teachings of The Church of Jesus Christ of Latter-day Saints. "The Church's participation will harm this spectacularly talented and beloved choir's image, misrepresent the diversity of Mormons worldwide, and sends the wrong message to LDS children as they will perceive the Church's participation as endorsement of a man whose words and actions do not align with our values." Kind of weird the name Chamberlin was part of the WWII start. Chamberlin ( British) visited Hitler and thought the guy was not all that bad. But exactly he opposite happened. I wonder if this is an repeat of what happened then. It looks like an "omen"